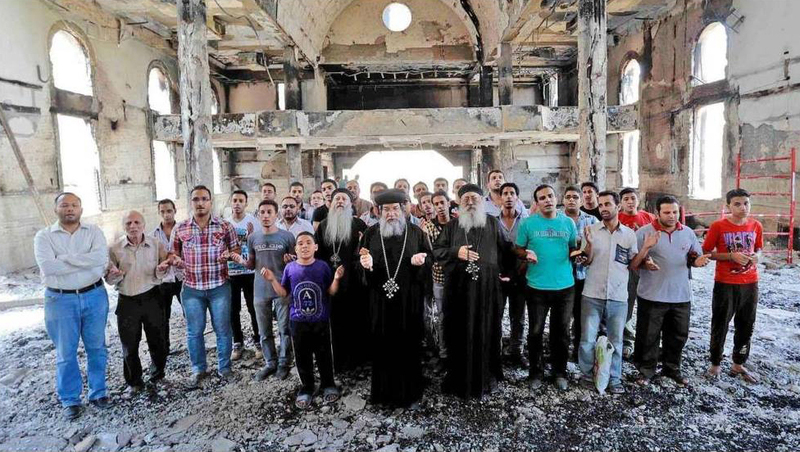 Coptic Christians pray in a burned church in Egypt in 2013. Egyptian President Abdel Fattah Al-Sisi vowed during a speech at Coptic Christmas Mass to rebuild and renovate all churches and homes that had been torched during violence in 2013. 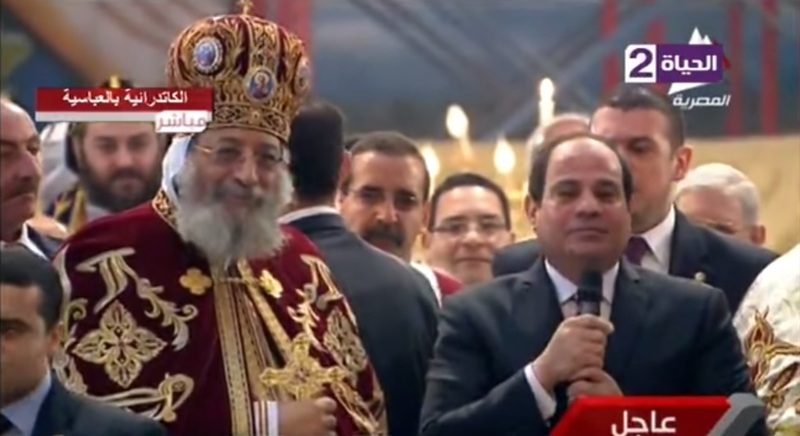 “We have taken too long to fix and renovate [churches] that were burned…this year everything will be fixed,” announced President Sisi as Coptic Pope Tawadros II stood by his side at St. Mark’s Coptic Orthodox Cathedral in Abassiya. “Please accept our apologies for what happened…God willing…by next year there won’t be a single house or church that is not restored,” added President Sisi, referring to the torching of churches and homes of Coptic Christians following the ouster of President Morsi in July 2013. President Sisi attended this year’s Christmas Mass and was warmly received. “We will never forget the honourable, respectful and great stance you and the Pope took during this period,” declared President Sisi amid cheers in the Cathedral. More than 53 churches and Coptic institutions were torched or stormed across Egypt following the ouster of Morsi and the Muslim Brotherhood in July 2013. Hundreds of other homes, businesses, and schools were also attacked in Sohag, Minya, Cairo, Assiut and other cities. In one incident, assailants torched parts of one of Egypt’s oldest churches that was reportedly built in the 4th Century. 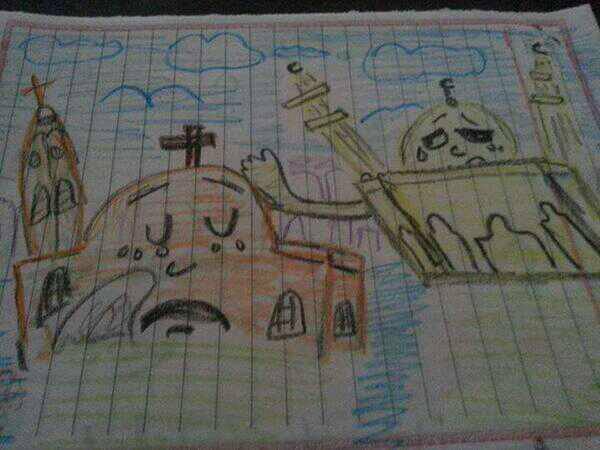 A schoolgirl in Upper Egypt drew this to show solidarity with Coptic Christians. The image went viral across Egypt. Meanwhile, at least 11 Coptic Christians lost their lives in sectarian-related violence following the June 30 protests. In one case in Minya, a Coptic man and his wife were detained before being killed by armed individuals. Despite the attacks being blamed on Islamists, stories and photographs of Muslims protecting Christians went viral across Egypt during the violent period. In statements to Egyptian Streets in 2013, Coptic Bishop Thomas confirmed that many communities united against extremism. “Poor Muslim families brought blankets to the Christians who lost their homes, and together we formed a civil front– not Christians against Muslims– but civil society against extremism,” said the Bishop. Since becoming President, Sisi has called for greater religious tolerance and reform in Islamic discourse. The Egyptian President also became the first Egyptian head of state to attend Christmas Mass. 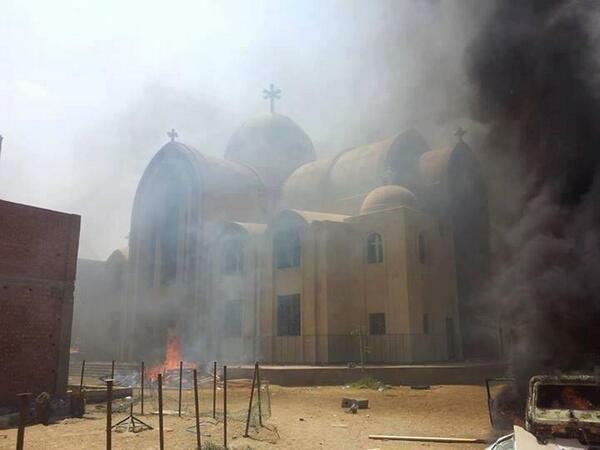 St. Mary’s Church in Fayoum attacked, looted in 2013. “We talk a lot about the importance of reforming religious discourse,” said President Sisi in a televised speech to Islamic scholars in December 2015. “In our schools, institutes and universities, do we teach and practice respect for the other?” asked Sisi. “We neither teach [respect for the other] or practice it,” declared the President in a grave tone.